If you’re in need of some fancy fonts and creativity in your proposals you are in luck. 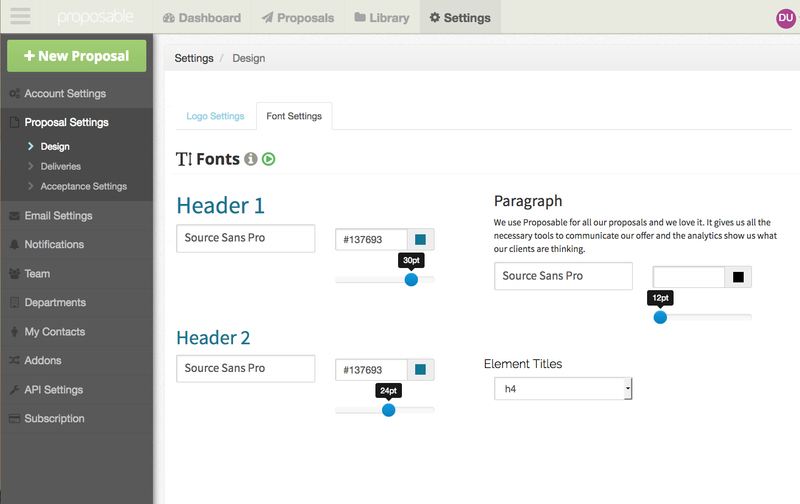 Under Settings > Proposal Settings > Design, you’ll find some options to set custom fonts. This functionality leverages Google Fonts which consists of 700+ fonts. This functionality is a global setting that an account owner can set of which all proposals and users will inherit. Keep in mind that if you make a change to the fonts, all of your proposals will be affected; even proposals that have already been delivered (In Progress). It is also designed to keep your brand consistent without all the cheesy fonts such as Comic Sans. You can specify both your Headers (H1, H2, H3, etc.) and the body of your proposals. The font settings will give you a preview and also allow you to choose or specify a color using the Hex code. Q. I set my fonts, but they aren’t the correct ones displaying once I hit save. A. If you copied and pasted text from another source (Word or an online source like your Website), you can have some unusual behavior with the copied text. It also may affect your output to PDF.